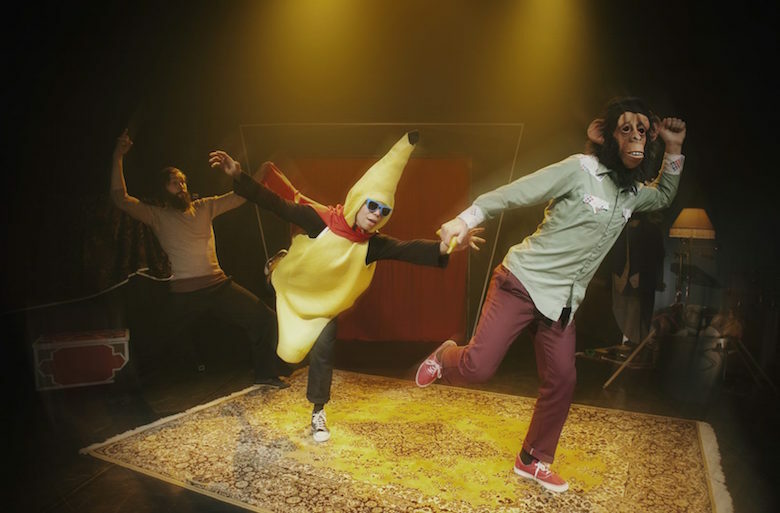 Around is a contemporary circus performance designed for children about the life of a small circus group, their mutual relations and overcoming difficulties through co-operation. Arriving with their caravan of hobby-horses the circus transforms an empty stage to a dashing arena during the show, using small pieces to form a great whole, ready for an eye-catching final number. The circus tools used in the performance are parts of the story and staging is used as performance objects. Through acrobatics, object manipulation and physical theater the circus director and circus princess along with the musicians build a platform for the circus numbers. The bill consists of juggling, acrobatics, hula hoops, soap bubbles, mime, clownery, break-dancing and all this accompanied by live music. The music composed for the piece imaginatively uses computerized music combined with traditional band instruments. A drum machine roars, buckets are drummed, vivid sound of an acoustic guitar joins the buzzing of a baritone ukulele. Musicians accompany the performers as in traditional circus, creating a world within the theme of the show. The easily transportable performance suits perfectly small stages such as schools and halls, allowing direct contact with the audience (children) without compromising quality. Another version of the performance caters for theaters with broader lighting and sound settings. Blackbox with proper legs and borders preferred.